Silk thread is produced by silkworms that twist their thread into strongly bound cocoons. The ancient Chinese exposed that if they soaked these cocoons in hot water, the threads would loosen and making it possible to loosen the silk thread onto a stick. Once the thread was collected, several strands were twisted together to make threads thick enough for weaving. By creating threads of different thicknesses, the Chinese could weave a range of different silk cloths, from light gauzes to heavy brocades. 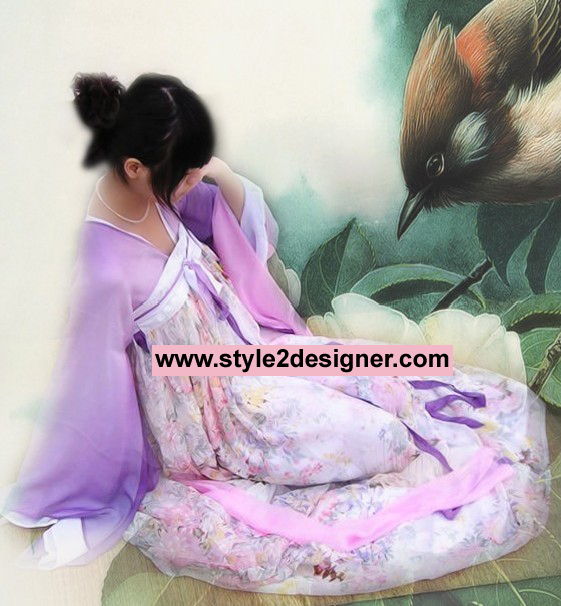 Chinese nobles wore colorful silk robes covered with embroidery. Silk was woven on looms to make fine cloth, but was also used for embroidery thread. The Chinese soon learned to embroider exquisite patterns onto silk cloth, often using a contrasting color. Some silk was made into beautiful clothes, and some was taken by merchants who traveled to the West, where silk sold for enormous prices. Soon, Chinese silk was so famous that the trading route that ran across Asia to Europe became known as the Silk Road. The Chinese had strict rules about dress. No merchants were allowed to wear silk, and farmers and craft-workers dressed very simply. Some wore cotton loincloths, while others had loose tunics and pants. On their feet they wore sandals made from rushes or straw. In the warm, wet south, peasants working in the fields wore wide-brimmed, cone shaped hats to protect them from the sun and rain. The enormous tomb of the first emperor of China contains more than seven thousand life-sized model warriors, placed there to guard his body. Made from terracotta and originally brightly painted, the warriors wear knee-length tunics. Some warriors have their hair tied in a topknot and wear a simple head band, but the officers sport elaborate bonnets with two wings at the top that tie under the chin. Some of the warriors carried real crossbows, which were set to fire if anyone dared to enter the tomb.